Ryan Gauld is "no closer to a return" after suffering a setback in his recovery from injury, says Hibernian manager Paul Heckingbottom. The midfielder scored for Hibs' development side last week, his first action since sustaining a hamstring injury against Celtic on 6 February. It had been hoped he would push for a place in the squad for last Friday's win at Livingston. "He's not been training," Heckingbottom said. 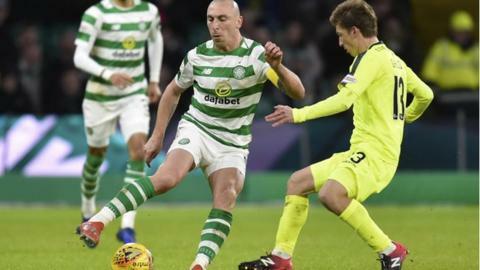 Gauld signed on loan from Sporting Lisbon in January and made five appearances but has yet to play under Heckingbottom, who replaced Neil Lennon in mid-February. "He is just not ready to be involved with us daily," the Hibs boss added. "It's the final part of his rehab and that's where we need to get him so he can train every day." Hibs, who sit sixth with two games left before the split, host third-place Kilmarnock on Wednesday night knowing victory will secure a top-half finish. They are unbeaten in the Scottish Premiership since the Englishman took charge, collecting 16 points from 18. "Top six is our sole focus. We were eighth, but we're in the thick of it now with teams who were a long way in front of us," added Heckingbottom. "The players' mental strength has been a big part of it. We've had to win games in different ways. Whatever has been thrown at the players, they've responded." Goalkeeper Ofir Marciano has been an ever-present under Heckingbottom and credits him with restoring belief at Easter Road. "The manager gives us confidence and you can see that in our results." Marciano said. "It's a pleasure to work with him, the players really enjoy training under him."